for the presentation REED DESIGN is a software to design and development kits of reed petals for reed valve. In fact it allows to see the behavior of a reed petal or of a reed petal plus stiffener to vary the size, material and shape according to different operating conditions. 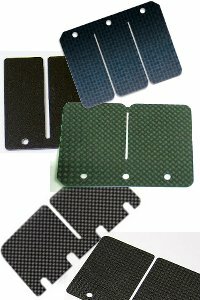 This is crucial to identify the most appropriate reed petals or to create kits with stiffener that enable you to make the best with the available material. Today, thanks the carbon fibers and fiberglass, you can easily to find sheet with various mechanical properties, the difficulty is to make the correct choice or create couplings with stiffener that provide the best results in the reed valve of racing engine for the different conditions of use. The software REED DESIGN was created to satisfy this need and is a fundamental support for those who want to develop kits of reed petals or want to improve the performance of their reed valve changing in a timely manner the reed petals. 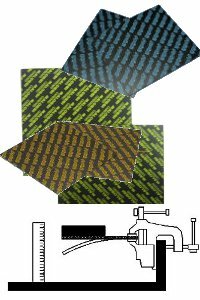 The software contains a database that already included the mechanical properties of sheets of carbon reed petals most sold (POLINI, MALOSSI, PINASCO, etc. ), and also those used in the racing engine (VORTEX, TM, PAVESI, MAXTER, AKTIVE, ROTAX, etc.). Also, if you have sheets or reed petals not included in the database that you do not know the mechanical properties, in the software REED DESIGN there is a form already seen in the software YOUNG REED for the calculation of Young's Modulus and of density of reed petals through a simple instrument diy. 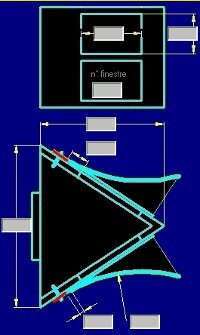 Entering the geometry of the reed valve and choosing the reed petals and stiffener to apply, the software REED DESIGN simulate the behavior of the reed petals to vary the pressure difference upstream and downstream of the reed valve. Moreover entering some data of the engine to which the reed valve is applied, the software REED DESIGN will indicate the effectiveness of the reed petals choices, both in terms of performance, both for the reliability. 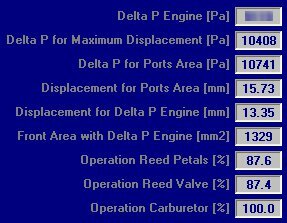 With the engine data the software provides also some indications about, port area of reed valve, diameter of carburetor and stopper radius, that would be more appropriate in relation to engine speed and engine power, so when you are developing the engine could determine not only the reed petals more adapted to the reed valve, but also evaluate changes to the reed valve itself and to the carburetor used. to design solutions with stiffener or with stiffener and spacer, in order to exploit, in the best way, also the materials that used only for the reed petals would not be effective for that reed valve or that engine. to design solutions with stiffener and spacer to have a variable stiffness that can increase engine efficiency without incurring in the resonance conditions.